The Anne Arundel County Mental Health Agency (AACMHA) is dedicated to ensuring that county residents with disabilities have equal access to public mental health services. In keeping with this commitment, there is a specially-tailored program for county residents who are deaf and need mental health services. We will develop additional specific programs for people with disabilities as needs are identified. The Maryland Relay for the Deaf contact number is (800) 735-2258. Deafnet Association, Inc. provides sign language translation via video conferencing for a fee. 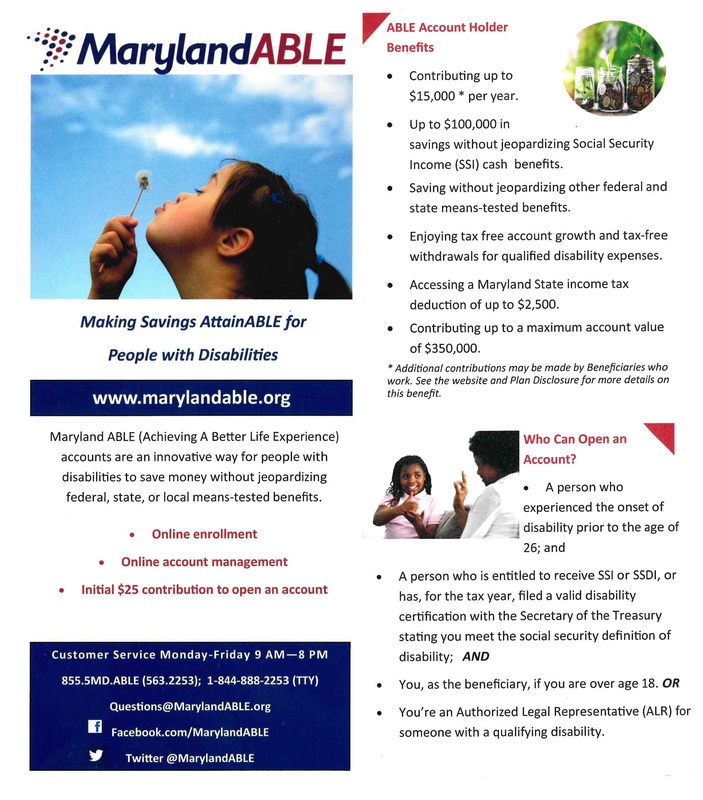 Maryland ABLE is a savings program which seeks to encourage and assist individuals and families in saving private funds to support individuals with disabilities to maintain health, independence, and quality of life. Maryland ABLE wants to provide secure funding for disability-related expenses on behalf of designated beneficiaries with disabilities that will supplement, not supplant, benefits provided through private insurance, the Medicaid program under Title XIX of the Social Security Act, the Supplemental Security Income program under Title XVI of the Social Security Act, the beneficiary's employment, and any other source. By increasing access to financial stability, ABLE increases access to health, independence, and a greater quality of life for Marylander’s with disabilities. Click here to visit the Maryland ABLE website. Click here for a Maryland ABLE flyer.